Macaroni and cheese has never really worked for me as a comfort food, so it's no big secret that nothing brings a smile to my face faster than daydreaming about standing on a street corner with a hot wiener in my hand. Perhaps that image was a bit too graphic for you and requires explanation - I'm talking about the iconic hot dog. Whether we christen it a frank, wiener, red hot, tube steak, or just plain hot dog is irrelevant - I'll never pass up the opportunity to go down on a good hot dog. A substandard weenie will not do - the casing, quality of the meat, preparation and even the ambience (with the street taking top billing as the dining environment of choice) makes all the difference in the world. Sometimes a simple steamed hot dog off an umbrella'ed cart, nestled in a white bread bun with a modest application of mustard (never the abomination that is ketchup) is all it takes, but I also like to walk on the wild side. 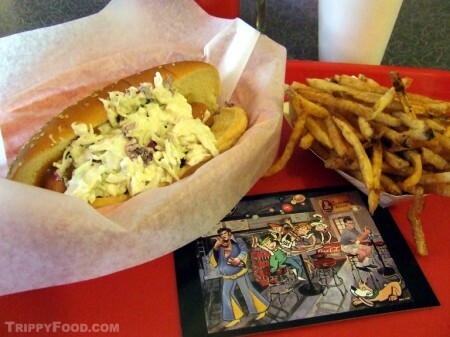 There are so many variations on a theme and not enough bandwidth to cover them all here, so let's focus on the dog dish that has come to be known in frankfurter circles as the slaw dog. 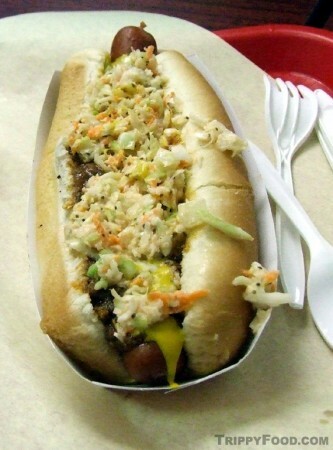 Most people agree that the slaw dog was invented (thrown together is a more appropriate word) in the early half of the 20th century in West Virginia. To this day, it is simply known there as a "West Virginia hot dog" and although its popularity spread out into North Carolina and the surrounding states, it has taken off like contestants in a dachshund race. There are multiple preparations of this Frankenfurter, with most involving mustard, beanless chili and a liberal application of coleslaw; often times mayo, ketchup and chopped onions are involved. 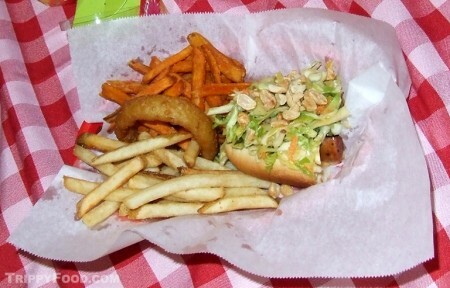 The version popular in the Carolinas often features BBQ sauce on the dog or sometimes mixed in with the slaw. It isn't difficult to find throughout West Virginia and parts of North Carolina in fine dining establishments, dive bars and diners alike. One spot that ramps it up a notch is Mount Pleasant, South Carolina's Jack's Cosmic Dogs, a cinder block box that looks like the 1950s version of a futuristic diner where you might park your flying car to grab a bite. The parking lot is strewn with surplus torpedoes and rockets from deceased amusement park rides, keeping with the Jetsonian theme, and once inside you're assaulted with neon, red Formica and chrome tables and flying saucer-shaped lamps. The menu is sci-fi themed, featuring dogs with such names as the Atomic Dog, Galactic Dog, and the New Frontier-sounding Neutron Dog; most of these have different combinations of the West Virginia dog ingredients, but also add or hold cheese, sauerkraut, pickles, relish, etc. I asked for their signature dog, the Cosmic Dog. This bad boy's bun was slathered with homemade sweet potato mustard that was both piquant and sweet, and topped with a mound of their blue cheese slaw (essentially coleslaw prepped with chunky blue cheese dressing). The Cosmic Dog was messier than a Sam Peckinpaw film, but much less uncomfortable to sit through; the fries were fried in peanut oil with their skins left on. An inspired take does not always equal a good hot dog if it isn't cooked right, but their tube steak was moist, hot and firm. As if their Cosmic Dogs and fries weren't enough, they also offer root beer on tap from Old Dominion Brewery (formerly in the D.C area but now located in Dover' Delaware. The rooty-tooty fresh and bubbly brew is served properly in frosted mugs and did more to evoke old-timey soda fountain goodness than any soda I've ever had. Of course if you're in SoCal and want to try the local recreation, there are two places to try. Pasadena, California's The Slaw Dogs doesn't waste time with a catchy name - they're all about bringing West Virginia west, but with a Southern California attitude. Despite their name, the most authentic offering goes by the superlative title of "#1 The Original", featuring everything you'd expect from the West Virginia patriarch with the addition of your choice of cheese. Several other coleslaw-themed hot dogs follow the Asian angle - the #8 Thai Slaw Dog starts with a chicken sausage and tops it with a cilantro-carrot slaw and plenty of peanut flavor (with a satay dressing and chopped peanuts). The only problem with the dish (besides the fact that a West Virginian wouldn't recognize it) is that the hot dog gets subdued by the thick vegetation crowning it. Their #9 Soy Bomb is a vegetarian offering features tofu and a ginger/sesame slaw - definitely not something you're likely to find in a Charleston gas station. 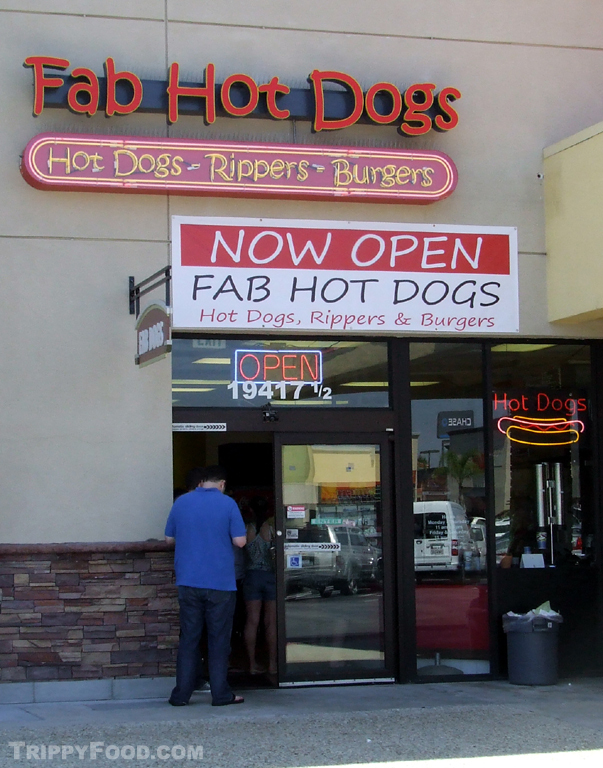 A more traditional alternative is Fab Hot Dogs in Reseda, California, hands-down one of my favorite purveyors of hot dogs not only in SoCal but quite possibly the U.S. for one reason - their spot-on recreations of regional favorites all available in a single location. 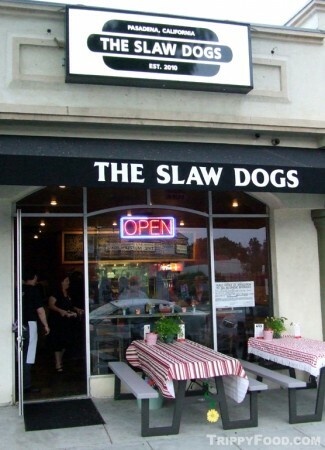 Expect to find their version of the infamous Oki-Dog, the Northern New Jersey ripper (on which they've built their reputation), the street favorite bacon-wrapped hot dog (lovingly called the LA Street Dog, although Angelenos often refer to them as "danger dogs") and last but not least, the Carolina Slaw Dog. Their tribute is as realistic as it gets - your basic all-beef hot dog topped with mustard, chili and garden-variety coleslaw. This is as close as you're going to get without springing for the airfare to Raleigh - a superb hot dog with chili that would complement a standalone chili dog and coleslaw like everyone’s mom used to make. I have had many of their other recreations, including the best Chicago-style dog I've had outside the Windy City. This entry was posted in Trippy Food (Tasty flora and fauna), USA and tagged Atomic Dog, Big Bite, blue cheese slaw, Brewery, bun, CA, California, Carolina, Carolina Slaw Dog, chili, coleslaw, Cosmic Dog, Fab Hot Dogs, frank, Galactic Dog, hot dog, Jack's Cosmic Dogs, Mount Pleasant, mustard, Neutron Dog, Old Dominion, onions, Pasadena, Peckinpaw, red hot, reseda, root beer, SC, slaw dogs, slawdog, South Carolina, Soy Bomb, sweet potato mustard, Thai Slaw Dog, The Original, The Slaw Dogs, tube steak, vegetarian, West Virginia, West Virginia hot dog, wiener, WV. Bookmark the permalink. Hey, I think Guy Fieri likes Fabs too. I heard some rumor that you dress like him. Great! These all looks yummy… Eating is my stress relief – I love eating. French fries are one of my favorites…mmmm, love it. Monique, have you seen my posting on French Fries at http://www.trippyfood.com/2010/09/23/i-like-them-french-fried-potaters/? I love hotdogs and fries! These all look yummy, it makes me hungry. Anyway, thanks for sharing – I hope I can visit those restaurants soon. Thanks, Gail. Hotdogs are my comfort food, and the West Virginia slaw dogs don’t disappoint. I’ve since had some other great dogs, so I’ll be doing additional articles soon.